If you are a usual car owner, you may not consider having a car jack until you stuck in the road only for that one of your car tire is blown. We can’t blame that its human nature not considering get the essential things at first place unless they face some real difficulties. Having a good jack like, scissor, hydraulic or electric jack will save your time to call for help in the middle of the journey. Hydraulic jack like best bottle jack is one step ahead for other traditional stand jack. It can lift maximum weight securely like, truck, bus, jeep, cars, covert van and so one. Also, these are good for use in factories, shops, and workshops for lifting massive machine, tools, and other items very quickly. Want to buy a bottle jack for your car or use in commercial vehicle repairing garage? We tried and tested some high-quality bottle jack for the car, truck, jeep, and factory machinery for a week. At first, we choose 15 best hydraulic bottle jack and find three garages that are currently working with these items. And some are from personal preference of our editors. Here is the final review that we got from our research. Have a look below. 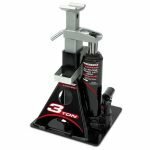 The Powerbuilt 640912 All-in-one bottle jack is a 3-ton capacity tool that designed to lift and hold a car to 8-5/8 to 18-5/8 inches. It prevents the necessity of having jack stands because of its a combination of bottle jack and jack stand. The bottle jack safely holds a car unibody up to 4000 lbs including sedans, CUV’s and small SUVs. The broad steel base of the jack gives it better stability to lift and hold weight better. Its light, little and cheaper than other traditional bottle jacks. The dimension of the tool is 9.8 x 9.8 x 12.2 inches and weight 22.2 lbs. Its made of following all the standards of ANSI and ASM. Overall, its a pretty durable and versatile tool for light jobs. Suitable for SUV and other types of cars. Includes a safety bar lock unit for different height adjustments. The handle feels little cheap. Some user complaint about its oil leakage sometimes. 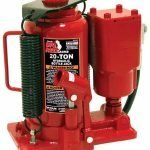 The Torin Big Red hydraulic stubby bottle jack comes with extra weight capacity in small budget. This tool can light up to 12 ton or 24,000 lbs weight. Its usable in the repair shop, factory floors, warehouses, repair shops, loading docks, and personal garage. You can use it for anything but were sideways, or downward force is needed. The dimension of the bottle jack is 14 x 12.2 x 8.7 inches, and weight is only 14.4 lbs. Its lighter from other bottle jack so you can deal with it at work flexibly. This bottle jack for car is made of high-grade steel, has a chrome plated cylinder, a glide action pressure. Also its heat-treated saddle and large size base make the jack useful for different types of workloads. Overall, a safe tool for lift and hold vehicles at 7.5 to 11 inches highest height. Suitable for lifting the enormous weight. Best use for a repair shop, warehouse, loading docks, etc. Lightweight and easy to lift. The Pro-Lift B-004D Grey Hydraulic Bottle Jack is a four to capacity bottle jacket that is suitable for any truck, auto service, farm, and shop use. It features a steel lifting saddle that is made for hold maximum load perfectly. The jack has an external screw that allows the jack to adjust in different height points. This best bottle jack features a built-in bypass system which protects it against ram over travel. You can lift with this bottle jack for lifted jeep from 8 to 15-3/8 inches. Its a 4.5 x 9.4 x 4.4 inches tool with 9 lbs weight. Compare than others, it’s relatively lightweight bottle jack to work with. Includes easy and simple use kit. The lighting saddle holds a weight securely. The built-in bypass system protects the ram from moving. The heat treated critical stress areas works well for a long time. The round tip is small. The color is ugly and prone to chip. Need a higher weight? 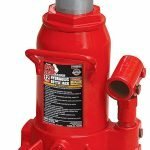 Then you should try the Torin Big Red Air Hydraulic Bottle Jack. Its a 40000 lbs or 20 Ton Capacity bottle jack which designed for professional usage. You can use it both manually and pneumatically. It has a quick air pump that works fast and reduces lifting time. The lifting range of the jack is 10-5/16 to 20-1/8 inches. You can efficiently use it for trucks, a school bus or any heavyweight vehicles. The size of this 20 ton bottle jack is 11.4x11x 7.3 inches and weighs 32 pounds. It’s little uneasy to use or move around due to the weight. However, this heavy-duty steel body of the jack makes it more durable and robust to work for a long time though. Easy to pump with is two piece handle. Design for work either manually or pneumatically. Durable corrisont fress steel construction. The extended air hose moves in any direction. No problem with leakage or drops. Get slow while working with a small compressor. Makes the wired sound of air piston noise. 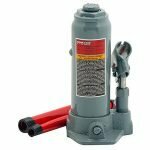 The Alltrade Powerbuilt 640407 bottle jack is a heavy duty bottle jack with 6-ton capacity. If you want an easy to use and strobe light jack, then this one would be great to buy. It comes with other weight capacities so you can go for that options too. The lifting range of this tool is from 8-1/4 to 16-5/16. Its an 11.9 by 7.5 inches in size and weighs only 10.75. Besides, of decent performance, smooth weightlifting and ideal height range the jack is very affordable as well. The Alltrade 640407 offers excellent stability and power while lifting a unibody because of its oversize cast iron base. Its meets ANSI standards though. The jack body is very strong durable. Lightweight and easy to work with. Suitable to store inside your vehicle. The sticks of the jack don’t feel they are same in quality. Here is another 2-ton bottle jack that works with your economic cars, industrial construction equipment in the factory and other objects. The Strongway Hydraulic High Lift Double Ram Bottle Jack is made for lifting heavy duty machinery. It has a low profile strong body that works smoothly. It can raise a weight minimum 5-15/16 to maximum 14-1/2 inches. It’s a 4-3/16 inch long and 4-7/8 inches wide. This low profile bottle jack takes less space in your garage than other jacks you have owned. It’s flexible to store in your car or toolbox for emergencies too. Short and low profile bottle jack. Long lasting lead-free paint is easy to clean up. Considerable cylinder diameter work in low oil pressure to raise a load. The piston sticks after the pump if there is no weight on it. And you have to lever it back down or push it up against something. Another bottle jack from Strongway Hydraulic. This one is 12 ton capacity jack with a sturdy steel body, broad base, and low profile design. Where a usual jack won’t fit Strongway Hydraulic Stubby Bottle Jack meets. It works vertically and fit for automotive and ag repair shops, an industrial environment, factory floors, and loading docks. But use cant use it for downward or sideways if you want. The size of the bottle jack is 5.2×5.1×7.5. It’s overall easy to fit into any small place in your garage. Also, it can lift the loads from 7.5 to 13.9 inches. You can use it for mini bus, trucks, covert van, etc. vehicles very quickly. Suitable for SUV and RV’s. Well made and very durable. Not take much space for storage. No leakage problems during work. Not found any disadvantage during use. Those who want a meager rate and relatively high-quality bottle jack can try Tonda Hydraulic Bottle, Jack Silver. Its a 4 Ton heavy duty jack to lift different types of cars and any kinds of machinery. This hydraulic bottle jack with durable steel construction, adjustable screw saddle, rugged base and many more options for smooth operations. The size of the bottle jack is 10.6x 9x 18.4 inches and weighs around 8 tons. The max lifting range for this bottle jack is 14.8 inches. It’s ideal for specialty SUV including truck service, farm, shop, auto, etc. its made my following ANSI and ASME PALD standards. Best for your SUV’s and another type of cars. Quick and simple to operate. Compact size easy to store. To get all the features, quality, and price the Omega 10065B Black Hydraulic Bottle Jack is really a good option for those who want 6 to capacity bottle jacks. Its work with truck, trailer and other heavy loads form various aspects. The Omega 10065B is a 4.6×4.2×9.2 inches size of the stud that weighs 10 lbs. The size and weight allow you to keep in your large vehicles and store it any narrow place in the garage. The jack is easy to use, lift and move around. Apart from that, it has a bypass mechanism built in. That protects the hydraulic system form the internal damage. Also, its hard cast steel, polished cylinders, and heat treated joints make sure every performance would be non-abrasive leak free during work. Durable less cause internal damage. The paint on the jack contains lead which is not safe for health. Last but not least our final best bottle jack review is for the ATD Tools 7387 Short Hydraulic Bottle Jack. Ita high capacity bottle jack with 20 Ton Capacity. The minimum height range capacity of the jack is 6.6 inches, and the maximum height is 11.3 inches. It can apply the highest 101 forces while lifting a load. It’s not like those other one-sided or way applicable power tool. You can use it both vertically and horizontally. Like other high-grade bottle jack, it has been designed and passed ASME, ANSI, PALD safety standards. The bottle jack for lifted truck is suitable to work with different vehicles changing a tire, lifting up the machine and all. It’s appropriate to use for the shop, factory and even for the personal garage. Overall. A cheap decent quality bottle jack for long-term use. Usable both vertically and horizontally. It may not fit on some cars under all way. A bottle jack is an automotive equipment which included of a hydraulic piston that able to lift heavy objects easily. Its designed to use for professional works. It has a fast-acting air pump that quickly lifts an object even the heaviest one. There are some simple but important factors to consider before getting a quality bottle jack for work. Want to know what are these? Check this out. The first and foremost queue. What do you want to lift with the tool, is it a car or machine or both. You can find 2 to 150 ton of bottle jack lifting different types of vehicles and machinery. Find what kind and weight of your particular project and then fix the capacity. Always try to get something that greater than your typical machine or vehicles. If your car is 2 ton, choose at least 3-ton ability. for the bus, jeep and mini size of trucks 50 ton bottle jacks or more will be good. Getting a low profile high capacity bottle jack is always best. Because, it requires little space to work, easy to handle and store. Your expensive and bulky gauge jack is ultimately a waste if it can be placed under the car. So, the working space underneath the vehicles also matters. So, measure the area an expert and then get a jack so you can work without damaging the vehicle body. Remember the ground clearance is lower with flat wheels. Not all high capacity bottle jack offers to exceed height limit. So what you need as greater height limit. Also, compare the strokes number that the tool needs for lift. You will find that in the product description- the number of steps a piston has. More steps mean more massive strokes. Also, check how many extensions are available with the jack. Some bottle jack comes with one or more additional extensions which comer maximum applications using the same tool. Most of the bottle jack come with two piece handle (some are not for that you have to buy a handle separately). However, it has a bayonet connector to insert the pins into L shaped Stolts. Park your car by ensuring the handbrake is on. Also, make sure the chokes are placed securely underneath the tires, so these don’t move quickly. Turn the valve clockwise tightly to close the release valve. Locate the lifting end of your car and center the saddle under that point. You can take help of your car’s user manual to recognize the proper lifting point. To make a connection with the car you need to unscrew the saddle using the extension screw. When you extract the saddle, it reduces the amount of pumping required. Adjust the saddle till it rests against the lifting point. Attach the handle into the socket and start pumping to lift the saddle to connect with lifting point. Keep pumping until it raises in you to your desired height. When the vehicle is in your desired height place, the axle stands to secure the lifting. Lower the car onto these stands by putting the pump handle into the release valve and turning it gently anti-clockwise. Once the weight is supported on the stands right the release valve anticlockwise. After your work did raise the car by bottle jack to clear the axle stands. Carly uses the handle to control the release valve this time by lower the speed. The small truck will slow the load lower gradually. So, keep that in mind and don’t be harsh during lowering. If you are like those people who consistently use a bottle jack for the car you should better know these tips and tricks for safe and effective use of a bottle jack. Before starting the work check the bottle jack either it’s broken or has damage part. Make sure it’s not bent or has leakage oil on the surface. Read the instruction guide or manual of the bottle jack to learn how to use it properly. Don’t cross the range of your bottle jack by loading an overweight machine or vehicle. Make sure your bottle jack matches with the work you are going to perform. Don’t be hurry during lifting or lower the load at first. Try to familiarize yourself with the components (handle, stroke, adjustments) to avoid any occurrences. Find the oil filter plug or screw of the jack. Take that out and put in the handle sleeve and the pump is for 5-8 time. It will lower the oil level under the filter hole. Now place it in the previous place. Use the bottle jack under a hard and level surface. Ready the right supporting materials for the hold up the load. Bottle jacks are not supposed to hold a weight for a long time. Don’t touch or try to adjust the safety valves. Rember, one should perform jack service if he is qualified to do so. Otherwise, you will meet danger or the car/machine you are working with will vigorously damage. Our editors pick for the best bottle jack is for Alltrade Powerbuilt 640912 Heavy Duty 3-Ton, Bottle Jack. This is one of the convenient bottle jack that’s good for easy lifting, storage, and longtime durability. Also, It offers a high range of weight raising which makes it best for work with a different ground clearance of car and machines. Its perfect for professional and personal usage though. However, the other range of bottle jack reviews in here are selected various working and weight demand. According to your vehicle size and type, you can find more than one option in here. 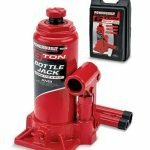 So, check these best bottle jack on their following links given here to learn more about them including price, warranty, etc. A Passionate Blogger and Affiliate Marketer. Founder and Chief Editor of 10Lista. Loves to Writer About Technology, Science, Entertainment and Life Hacks.